The champions of the East and Central Division will meet in the Eastern Conference Championship. 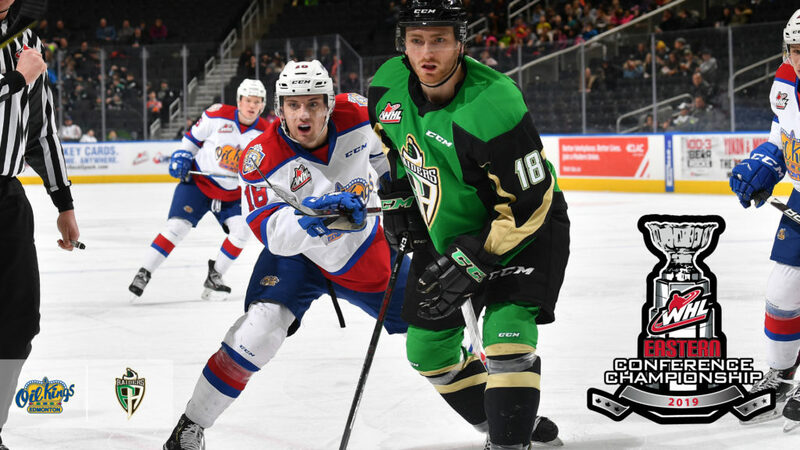 With their Game 6 victory Sunday, the Prince Albert Raiders confirmed their spot in the Eastern Conference Championship, set to take on the highly-touted Edmonton Oil Kings. Both teams took 10 games to reach this stage of the 2019 WHL Playoffs with the Raiders sweeping the Red Deer Rebels in the first round and then finishing off the Saskatoon Blades in Sunday’s aforementioned Game 6. As the winners of the Scotty Munro Memorial Trophy, the Raiders will hold home-ice advantage for the series. The Oil Kings took six games to conquer the Medicine Hat Tigers in the first round before sweeping the Calgary Hitmen in the second round to advance to their fourth Eastern Conference Championship in team history. Meeting this year will mark the second time the two have competed against each other in WHL Playoffs history. The Oil Kings swept the Raiders in the first round of the 2014 WHL Playoffs en route to winning the Ed Chynoweth Cup and later capturing the Memorial Cup. Prince Albert controlled the regular season series with a 3-1-0-0 record, though one of those wins came in overtime, giving the Oil Kings a 1-2-1-0 record conversely. It should be worth noting that Edmonton’s lone win in the season series came on February 1 in Prince Albert, handing the Raiders one of their four regulation losses on home ice all season. Noah Gregor (San Jose Sharks) led all players in scoring in the season series with eight points (2G-6A). Cole Fonstad (Montreal Canadiens) and 2019 NHL Draft prospect Brett Leason each recorded seven points against the Oil Kings this season with Fonstad scoring four goals to Leason’s one. On Edmonton’s end, captain Trey Fix-Wolansky (Columbus Blue Jackets) led the Oil Kings with seven points (5G-2A) while their leading defenceman Conner McDonald had six points (3G-3A) against Prince Albert. Overage forward Vince Loschiavo found offensive success against the Raiders with five points (3G-2A) in four games himself. In net, Dylan Myskiw and Ian Scott (Toronto Maple Leafs) should be the leading men for Edmonton and Prince Albert respectively. However, the only goaltender to post a save percentage above .900 in the season series was Boston Bilous, who appeared in 12:36 of action. Scott earned two of the Raiders’ wins while Donovan Buskey had the other. Myskiw took a regulation loss in his lone appearance while Todd Scott had a 1-1-1 record in 181 minutes of action against the Raiders. The series will begin at the Art Hauser Centre with Game 1 on Friday, April 19 (7:00 p.m. MT). The series will shift to Rogers Place for Game 3 on Tuesday, April 23 (7:00 p.m. MT).